Dean 'mugggggy' Quinn was the PocketFiver that racked up the most 888poker money in the month of November. 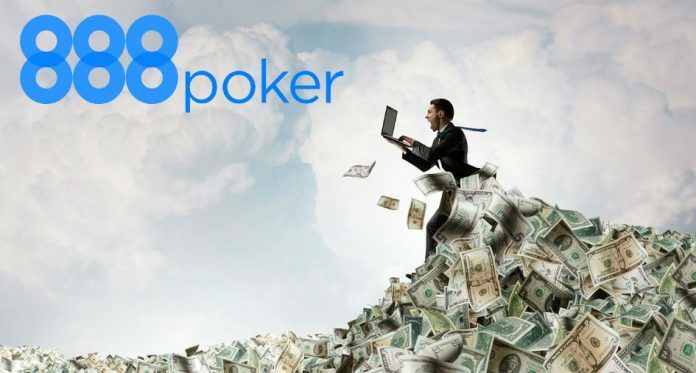 It’s August now, but during July there was a handful of PocketFivers that did some real damage on 888poker. Nobody earned more than Alessandro ‘Crib09’ Valli, nobody cashed more than ‘DoperHarley’ and nobody found a victory more often than ‘hudfoter’. Valli earned $61,662.62 thanks largely to his ability to dominate the Whale on back-to-back Sundays. He first picked up $10,050 for finishing third behind Johannes ‘Greenstone25’ Korsar and ‘Machiavelli3’ in the $1,050 Whale on July 22. The next Sunday he gained some revenge on ‘Machiavelli3’ by defeating the Swedish grinder heads-up to win the $1,050 Whale for $23,424.13. He cashed 56 times in the month, including two more wins. Russia’s ‘DoperHarley’ cashed 73 times on 888poker in July – the most of any PocketFiver. Playing predominantly microstakes tournament,s ‘DoperHarley’ picked up three wins, four runner-up finishes and a third place score as well. His total earnings for the month were $1,698.26. Right behind ‘DoperHarley’ in the most cashes category was ‘hudfoter’ with 71 total cashes. He made the most of those finishes though, picking up 10 total wins, four runner-up finishes and seven third-place results. His biggest score of the month came on July 9 when he topped a field of 1,504 players to win the 888 Poker $5.50 BIG Fish for $1,697. He’s now the #11-ranked player in Slovenia. The closest thing ‘hudfoter’ had to competition last month was from Russia’ Denis ‘DENGER’ Kuznetsov who picked up seven wins.